Designed specifically for flow measurement in round pipes or stacks of 12 inches [300 mm] and larger diameter, and square or rectangular ducts with cross sectional area of 100 inches [250mm] and larger, the model ST102A Flow Meter and the new MT100 Series Flow Meters from Fluid Components International (FCI) provide two to eight non-clogging, no moving parts sensing points that ensure superior accuracy repeatability and reliable operation. FCI’s advanced multipoint air/gas thermal flow meters combine state-of-art electronics technology with application-matched, precision flow sensors and calibration in a rugged package designed for the most demanding plant operating environments. They are also always dual-function, providing both flow rate and temperature of the process. The multiple FCI thermal dispersion sensors are inserted at various depths within a pipe or duct and their outputs are multiplexed and averaged to produce the flow rate within the process line. Where dual point sensing is sufficient, the ST102A Flow Meter is the ideal solution. In more complex applications such as larger exhaust stacks, the MT100 Series Flow Meter provides up to eight sensors. Both flow meters are easily installed in a simple insertion tap. In large stacks with platforms, they install in single plane resulting in significant savings in installation costs and maintenance access. These flow meters are direct mass flow measuring, they operate over a wide 100:1 turndown and are compatible in processes operating at up to 850 °F (454 °C). They have no orifices to clog, and they provide a superior solution in flow streams with moisture, dirty particulates or corrosive aspects. The best-in-class transmitter available with the ST102A and MT100 features an extensive choice of output options to interface with virtually any DCS, PLC, SCADA, or recorder. Dual, isolated, high resolution 4-20mA outputs compliant with Namur NE43, HART (Fieldcomm Group™ certified), Foundation Fieldbus (Fieldcomm Group™ certified), Profibus-PA, Modbus, 0-1kHz frequency/pulse and a USB port are all available. 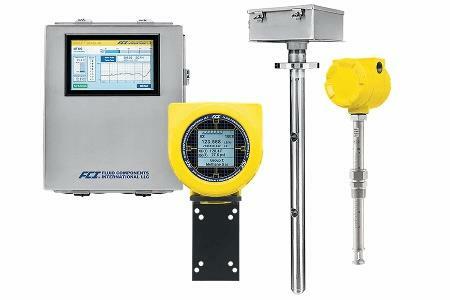 Both meters feature a leading edge, large LCD readout that provides comprehensive process information with both analog and digital displays of flow rate, temperature and totalized flow, bar graph and/or digital strip-chart of flow rate, alarm conditions and instrument health and calibration diagnostics. They also include a user programmable data logger that records flow rate, temperature and totalized flow as well as diagnostics results on a removable, 8GB microSD card. The electronics are housed in rugged-duty enclosures for long-life and protection from outdoor elements and with IP ratings from IP64 to IP67. These meters have been independently tested and verified to meet and comply with IEC safety directives for EMC and LVD, and carry the CE marking. Optionally available for process installations with hazardous, potentially explosive gases and/or dust, they can be ordered with FM/FMc, ATEX or IECEx and other HazEx agency approvals for Division II/Zone 2 or Division I/Zone 1. In addition to the flow meters themselves, FCI provides extensive global field services to ensure the most effective installations. Start-up assistance, pipe traversing to optimize sensor point placement and bus communications integration are just a few of the services FCI can dispatch to a customer’s site anywhere in the world. Fluid Components International is a global company committed to meeting the needs of its customers through innovative solutions to the most challenging requirements for sensing, measuring and controlling flow and level.